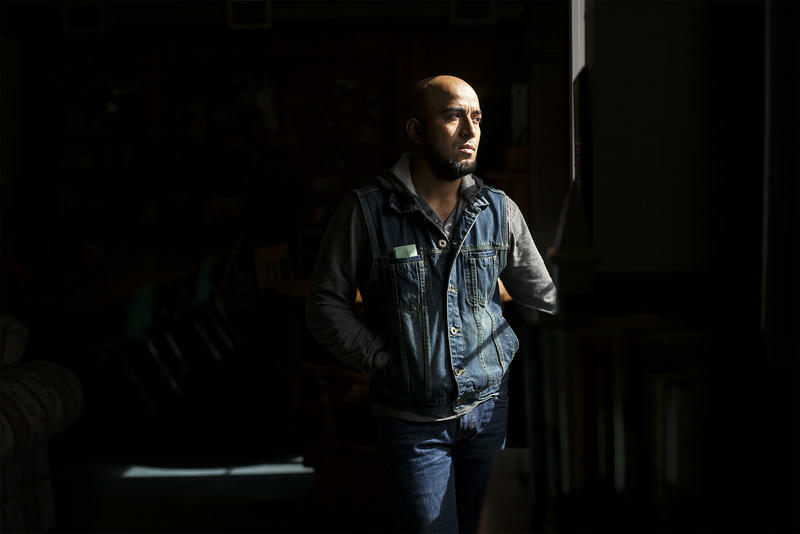 Alex Garcia poses for a portrait at Christ Church, United Church of Christ, where he’s taking sanctuary. 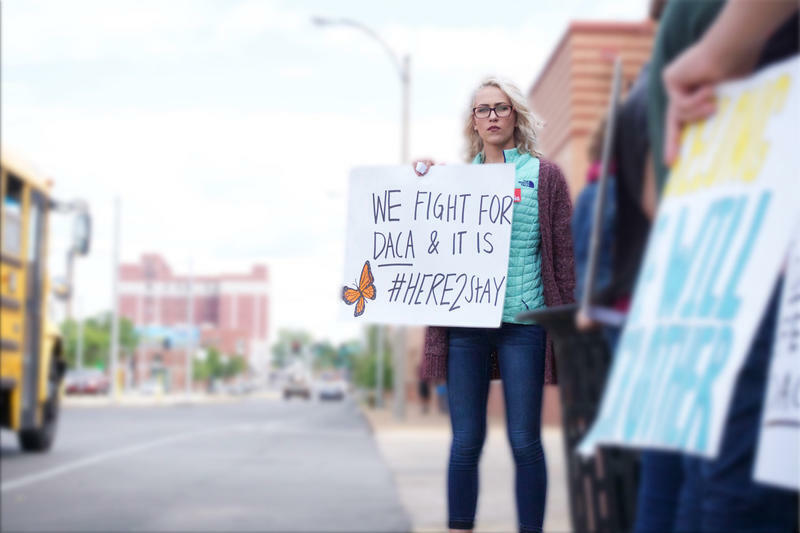 From their home in Poplar Bluff, in southeast Missouri, Carly Garcia made a frantic call to an attorney, who put her in touch with immigration activists. They told her Alex had two options. He could do as immigration officials had ordered and report to an ICE office to be jailed and sent back to the Honduran countryside he left nearly two decades ago. Or he could seek sanctuary in a church. “My mom always said choose your battles wisely,” Carly Garcia said. She couldn’t imagine her life without Alex so they made the only decision that gave them a chance to keep their family intact. 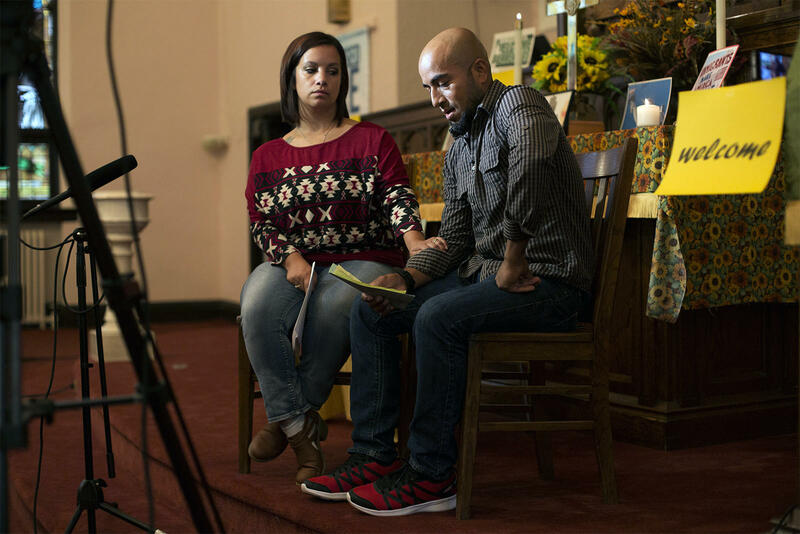 A church in Maplewood is providing sanctuary to a Alex Garcia, a Missouri man whose been ordered to leave the United States. On the day Alex was supposed to report to ICE, he packed a duffle bag and instead went to Christ Church, United Church of Christ, in Maplewood. 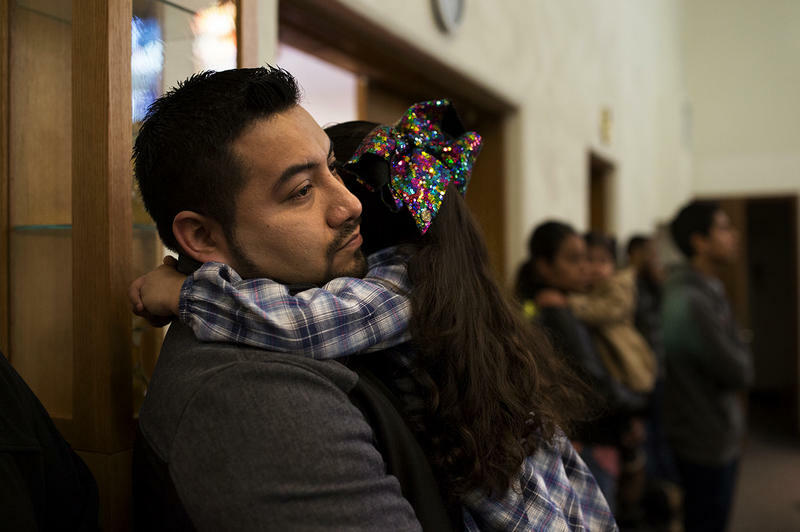 He is one of more than 30 people across the United States who are publicly taking sanctuary in a church — a safe haven of sorts, typically viewed as off limits by immigration officials. 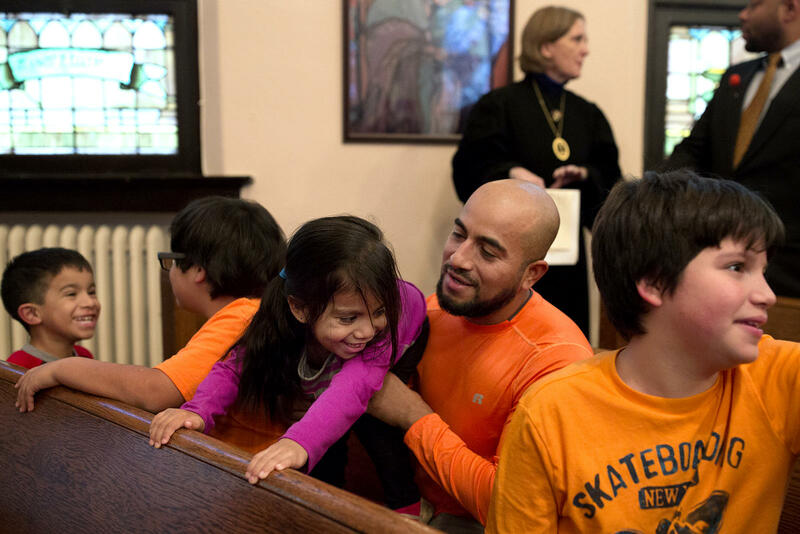 Christ Church is part of a growing network of congregations pledging to provide sanctuary to take a stand against an immigration system their leaders say is broken and immoral. “We can’t act like some human beings just don’t matter as much as others,” said the Rev. Rebecca Turner, who agreed to welcome Garcia two weeks before his arrival. “Their family is just as important to them as mine is to me,” Turner said. Alex Garcia jokes with his 3-year-old, AriannaLee, while sitting with his family before the start of a church service. In the months before Alex Garcia arrived at the church — as President Donald Trump vowed to take action against immigrants living in the U.S. without authorization — a small group of activists and clergy members in St. Louis gathered to discuss providing sanctuary for those most vulnerable. Since 2014, more than 15 people have received relief from deportation — usually in the form of a temporary stay of removal — while living in sanctuary. Activists say sanctuary works as a tool to protect people as their lawyers file requests for temporary deportation relief. Even though these requests typically include the church’s address, an internal ICE policy limits enforcement action at places of worship. Sanctuary is also part of a broader strategy to raise awareness about the way immigration laws are enforced, said Sara John, executive director of the St. Louis Inter-Faith Committee on Latin America. John is coordinating sanctuary efforts in the region. Taking public sanctuary, she said, allows people to share stories about how immigration enforcement affects their families. Xander, 5, sits with Alex while eating dinner during a weekend visit to Christ Church. Alex Garcia, 36, has lived at Christ Church for four months. On the weekends, his wife and kids make the two-and-a-half hour drive from Poplar Bluff to visit him. They play games and eat takeout and watch movies. When it’s time to leave, the kids beg him to come home with them. During the week, he spends a lot of his time working. He uses his construction experience to fix things inside the 98-year-old building and sometimes helps inside the church’s commercial kitchen. Since September, he’s met countless volunteers and congregation members. They ask him about his life. So he tells them about leaving Honduras as a teenager, with his mother’s blessing and not much else. And about how he got on a train in Texas in search of the American dream and ended up in Poplar Bluff. How he met his wife there, more than a decade ago. How his kids are his everything. A lot of the people he speaks to are surprised to find out there’s never been a path to U.S. citizenship for him. Because he was apprehended and deported the first time he tried to cross the border, years before making it to Missouri, he cannot easily apply for permanent residency — even though his wife was born and raised in the United States. To do so, he’d have to first leave the country for at least 10 years. John, the sanctuary organizer, believes telling stories that highlight the obstacles immigrants face when trying to fix their legal status might help lead to comprehensive immigration reform in Congress. The Rev. Rebecca Turner leads a prayer outside the ICE sub-field office in St. Louis. Nicole Cortés, left, filed paperwork requesting a new stay of removal for Alex Garcia. John points to the roots of the sanctuary movement, which started in the 1980s when U.S. congregations opened their doors to Central American refugees. The movement’s goal then was to educate the public about how U.S. military intervention devastated Central America and led to the instability and human rights abuses that caused people to flee. Organizers hoped that as people learned the refugees’ stories, public perception of U.S. policies would start to shift. This new sanctuary movement, she said, aims to do the same. But for now, her goal is more focused: To get ICE to grant Garcia a stay of removal and reunite him with his family. His 12-year-old son, Ayden, who has Asperger syndrome, has become more withdrawn without his father around. And Carly’s 11-year-old son, Caleb, — who Alex has cared for since he was a baby — is struggling in school. “Since he’s been here, it’s been harder for me,” said Caleb, as he sat in a church pew about a month after Alex took sanctuary. Carly Garcia said that before she met her husband, she relied on public assistance. Shortly after she moved in with Alex, she canceled her food stamps. Now, she’s struggling again. Carly Garcia comforts her husband, Alex, as he nervously reads from a prepared statement during an interview with a TV news station from Poplar Bluff. One of the things that keeps her going is the outpouring of support her family has received. On a recent night, more than 50 people packed the Christ Church dining room for a potluck and strategy session. Alex’s lawyer, Nicole Cortés of the Migrant and Immigrant Community Action Project, is getting ready to file a new stay of removal request. The packet includes more than 800 signatures of support from neighbors in Poplar Bluff and a letter from state Rep. Gina Mitten, whose district includes Maplewood. In the meantime, supporters are reaching out to a regional Immigration and Customs Enforcement field office in Chicago. The director there — Ricardo Wong, a Jamaican immigrant — has the power to grant Alex a stay of removal. If he wins a stay of removal, Alex would be able to leave his makeshift apartment, walk out the church doors and go back home to his family. But without any paths to permanent residency under current immigration law, his win would still be temporary. Jose Garcia and his partner, Ana Ortiz, shuffled quietly into the warmth of a packed Sunday Mass at Our Lady of Guadalupe in Ferguson. Their older daughters, Julissa, 11, and Dana, 7, disappeared into the pews looking for friends. Garcia picked up 5-year-old Amanda and rocked her in his arms. For more than a decade, Garcia attended Sunday Mass with his family. But this November morning was different. A St. Louis woman from Haiti is among immigrants who are concerned about the future of family members and others without documentation, despite the recent restoration of certain protections. The U.S. Citizenship and Immigration Services announced it is accepting renewal applications from young people seeking protection under Deferred Action for Childhood Arrivals (DACA). The Obama-era program protects undocumented immigrants who came to the U.S. before age 16 and were under the age of 31 when the grant took effect in 2012. President Donald Trump sought to end DACA. A federal judge temporarily blocked that decision this month.